« Day 186 in Beijing: Cabvertising. 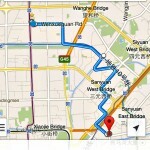 Day 187 in Beijing: Google Maps. I tend to take a lot of buses, taxis and subway rides. Google map is the go to app for me at this point. 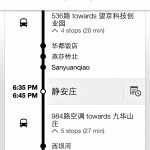 If I could read Chinese, I’d use the local one called Baidu. However, I don’t, so I won’t. Google maps are usually pretty decent because they are as up to date as they could be with all the changes in Beijing each day. There are a few problems I’ve noticed with their maps. They tend to pull up slowly and sometime they can not connect to the server at all. I’ve been told this is because their servers are overseas and so that limits the speed and connection. When this happens, I have to rely on old fashioned ingenuity and guess. It turns into an adventure, which is one of the reasons I travel anyway, so that is fine with me. However, their “on-time” for the buses is absolutely hilarious. 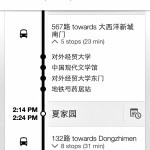 It would make more sense to just delete the time schedule and put up a notice stating, “Beijing traffic is going to take a lot longer than you can imagine and just accept that reality that your guess is as good as Google’s.” I don’t think anyone would blame them. As for the maps themselves, they are very cool. Sometimes they are in plain English, and other times in Chinese. They are very detailed and have a lot of information. They also have lots of different routes and the time and effort into gathering all this data must have been amazing. 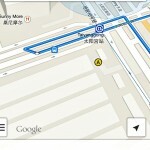 So, thank you, Google, for making my trips around Beijing much easier and much more understandable. I’ve learned to pay very close attention when I ride the bus and match the symbols. Directions to my home. Well, a few blocks from my home. There is a bus and a subway stop right near each other. Some in English, some in Chinese. Chinese looks cooler.